AMMAN: A 24-hour deadline set by the Victory Army that called for members of an allegedly pro-Islamic State rebel brigade in Daraa province to turn themselves in and “avoid bloodshed” following the assassination of their leader by Jabhat a-Nusra expired Monday afternoon with unclear results. Muhammad “Abu Ali” al-Baridi, the head of Liwa Shuhadaa al-Yarmouk also known as al-Khal (the Uncle) was assassinated alongside several other members of his top leadership in the southwest Daraa village of Jamleh Sunday afternoon in a suicide attack claimed by Jabhat a-Nusra. Hours later, the southern branch of the Victory Army posted an online statement giving “all the members of Liwa Shuhadaa al-Yarmouk with no blood on their hands” a 24-hour grace period to surrender themselves and their weapons by 5:30pm Damascus time Monday in order “to avoid bloodshed and turn this shameful page of that deviant group’s allegiance” to the Islamic State. Liwa Shuhadaa al-Yarmouk leader Abu Ali al-Baridi. Photo courtesy of Orient News. “We heard the sound of a strong explosion,” coming from the former Baath Party headquarters in the village, Abu al-Ezzam, a Jamleh resident told Syria Direct Monday. “We ran to the place, and there were body parts scattered everywhere. The Baath division was “known as a meeting place for Liwa Shuhadaa al-Yarmouk leadership” in Jamleh, Abu Nawras told Syria Direct Monday. Liwa Shuhadaa Yarmouk’s remaining leaders took a defiant stance to the assassinations and Nusra’s ensuing demands in an announcement mourning al-Baridi published on social media Sunday. Jamleh, a village 1.5km due east of the Golan Heights and around 8km north of the Jordanian border, is Liwa Shuhadaa al-Yarmouk’s (LSY) headquarters. It is one of several villages controlled by LSY in the southwestern Daraa countryside surrounded by turf controlled by rival rebel groups Jabhat a-Nusra and Ahrar a-Sham. In addition to al-Baridi, five members of LSY’s “high-ranking leadership” were killed in the suicide attack, Abu al-Ezzam says. The total number of casualties was not immediately clear. LSY Deputy Commander Obaideh Qahtan, who was himself the target of a failed assassination attempt a few months ago, was appointed the new head of the group in a second announcement on Sunday. “The assassination will not affect Liwa Shuhadaa al-Yarmouk,” Abu al-Haj, a sympathetic rebel fighter in Daraa told Syria Direct on Monday. “Al-Qahtan was the actual leader, and al-Khal was the face” of the organization. Sunday’s assassination is the latest in a series of sporadic bombings, kidnappings, assassination attempts and clashes between Liwa Shuhadaa al-Yarmouk and Jabhat a-Nusra since last December when Nusra accused Liwa Shuhadaa al-Yarmouk of pledging allegiance to the Islamic State. LSY denies affiliation with the Islamic State. 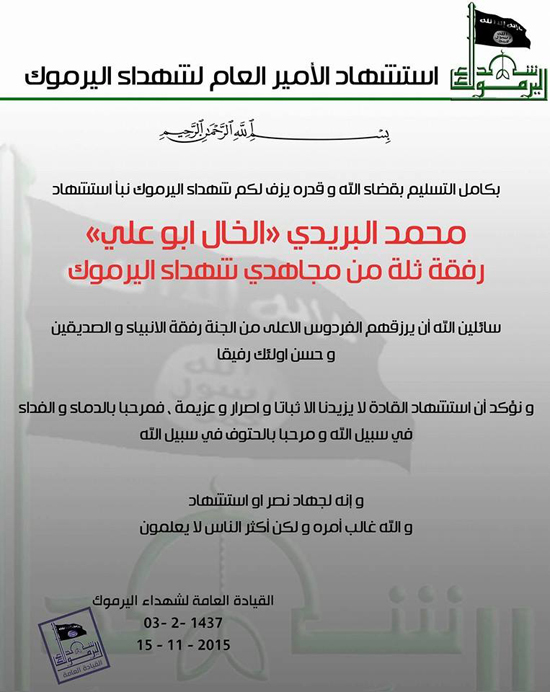 Liwa Shuhadaa al-Yarmouk was formed in 2012 in southwestern Daraa province as a branch of the Free Syrian Army, but in the years since has grown increasingly ideologically stringent and isolated from other rebel factions. LSY’s current flag features its name in green and a miniature rendering of the Islamic State’s. Partisans have recently implemented punishments in villages under their control for smoking, public beatings and niqab distribution campaigns, giving rise to harsh criticisms. One Daraa rebel fighter sympathetic to LSY describes the past year of fighting as the product of Jabhat a-Nusra’s provocations. “Al-Khal had not done anything but respond to Nusra’s attacks, for they are the ones who started it and they are the ones who committed a string of operations to assassinate him, and he had not done anything but defend his areas,” said Abu al-Haj, who is not with LSY but declined to publicly state which brigade he fights with for security reasons. “Al-Baridi was a man in the truest meaning of the word, and a property owner, and had lost all of it for the good of Islam and the revolution,” he said. The infighting is a detrimental distraction from broader strategic goals, the rebel fighter said.